Our best selling EcoGlow Chick Brooders have been redesigned to be even safer, more economical and easier to clean. The new EcoGlow Safety 2000 Chick Brooder is ideal to raise up to 50 newly hatched chicks or ducklings and is suitable for any waterfowl or game-bird chicks and for classroom hatches. 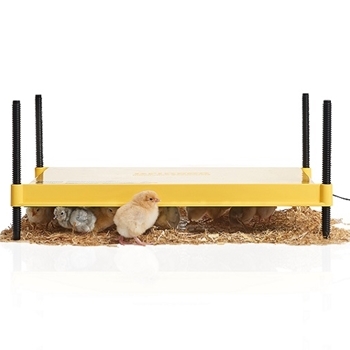 The new EcoGlow Safety Chick Brooders use a metal warming plate to even out hot and cold spots which occur with plastic heat plates and to improve heat radiation. Unlike other chick heating plates the Brinsea EcoGlow Brooders run at 12 volt from a mains transformer supplied - a much safer option than mains voltage and features a generous 10 feet power lead. Its 4 adjustable legs allow you to adjust the height according to the size of the chicks. For brooding smaller numbers of chicks see the Ecoglow Safety 600 or 1200. IMPORTANT: This product is for indoor use only and the room temperature should not drop below 50°F (10°C). The EcoGlow chick brooders are designed to be extremely economical to use, especially for small numbers of birds. A typical heat lamp runs at 250 watts compared with 12 watts for the EcoGlow Safety 600 or 18 watts for the EcoGlow Safety 1200. Considering the brooder is on 24/7, this is an important saving. To get the best use from these low power chick warmers it is important to understand that there is no big margin of ‘spare’ heat and some precautions need to be taken depending on the ambient temperature in the room, and on the age and number of chicks – and the size or species. Please note that the EcoGlow chick brooders are for indoor use only and that the room temperature should not drop below 50°F (10°C). First, it is better to have the brooder on a lower height setting, if in doubt. The chicks will move away from the EcoGlow heating plate if they are too warm. If brooding very young quail or very small numbers of any small birds, it is a good idea to confine them in a cardboard box at least twice the size of the EcoGlow chick warmer, but put the warmer against one side of the box so that the birds can only enter on the other side. This conserves warmth under the brooder but still allows birds to move freely out into the open as they wish. Another useful trick is to put the whole box on a slab of 1” Styrofoam to reduce heat loss from the bottom. In an extreme case, one end of the heating plate may be set lower than the other. This gives very small birds to option to touch the warm under surface of the chick brooder heat plate or adjust their position for maximum comfort. Because the heat from the black underside of the EcoGlow is largely radiant, measuring the temperature with a thermometer is of little value. Radiant heat passes through air without warming it. Only a solid object will absorb and be warmed by Radiant heat. So a thermometer will register the air temperature but not the radiant heat and will usually show some 5 to 10°F lower than the effective temperature felt by the chicks. Always watch the behavior of the birds. They will naturally huddle together if they are cool. The more of them, the less external warmth they need. For larger numbers of birds, two to four EcoGlow chick brooders can be assembled side by side. Above four units, it is probably better to leave a gap between units for birds to exit freely. The larger EcoGlow Safety 2000 is also available.